She was four-foot-something, ancient, squat, and elegant. I assumed she was Russian, though I only ever heard her speak once. She was born before there was such a thing as the Warsaw Pact, before the Cold War, before the founding of the Bolsheviks. Even in her diamonds and furs, she did not seem out of place in our eleven-story, turn-of-the-century university building, nestled between Harlem and the Hudson, where the elbow-patched faculty of the 1970s lived alongside the Old World émigrés of earlier decades. I could already see over her hat by the time I was in middle school. She smiled through her wrinkles when she saw me in the elevator, and nodded to me when I held the large glass door for her in the lobby, but she remained silent. I saw her almost every day, waddling to or from Broadway with her furs, her prim little gloves, the massive purse that dangled from her elbow. I marveled that she never got mugged, when I wasn’t even safe walking the seven blocks home from school. 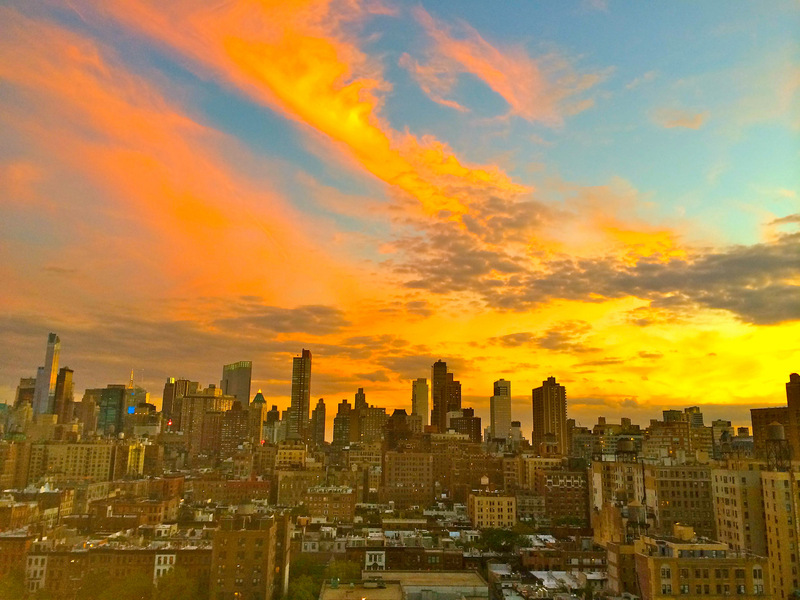 Upper Westside Sunset by Sarah Ackerman. CC license. She was far older than my Oma, though an outsider may have noted similarities. They were both European dowagers living in New York. My mother’s mother, a diplomat born in Vienna, had fled the Nazis and married a Columbia economist. My mother and I lived with her in the late economist’s faculty apartment. My mother’s boyfriend lived there, too. He was the one who named our mysterious elderly neighbor the Hit Lady. That made sense to me, and it explained how she managed the mean streets of Manhattan, safe from both criminals and cops. Dressed as if always headed to a winter evening at the ballet, she was the last person the police would suspect, though somehow the first one that we did. Perhaps that was because we read the right kind of fiction, the sort that taught us what to look for: Those formal lady’s gloves, worn year-round, precluded fingerprints. That enormous purse could hold a handgun, complete with silencer, though I imagined she favored an array of toxins, delivered by covert mechanisms of Soviet design. Everyone in the apartment —my grandmother, my mother, her boyfriend—we all read murder mysteries and spy novels. Our elderly neighbor fit perfectly in the pages of our favorite paperbacks, so we all took to calling her the Hit Lady. The label caught on with my friends, too. I would point her out to them and announce that the Hit Lady was off to claim another victim. I’d urge them to watch the news for stories of powerful people dying mysteriously during a visit to New York. I cautioned them that it might not look like the sort of murder we were used to. I’d done my research. Department 13 of the KGB—what the Soviets called their “Directorate of Special Tasks”—preferred their efforts to be mistaken for natural causes. They had packages that sprayed bubonic plague, cigarette boxes that fired clouds of cyanide, and tea cups laced with thallium: a colorless, odorless, and tasteless soft metal that withered the target from the inside out. Still, I preferred to picture the Hit Lady standing over her victim, blowing smoke from the silenced barrel of an oversized pistol. I returned from school one afternoon to find her in the vestibule of our building, puzzling over the lock to the inner lobby door. She had on the full outfit: mink hat, mink coat, and a long dark dress, though not long enough to cover her slip, which hung past the hem, lopsided and sallow. She stood close to the glass doors, blocking my view of her struggle. I cleared my throat, hoping not to startle her, and asked if there was any way I could help. She slowly looked toward me, shuffling her feet to get herself turned around. She smiled at me and mumbled something in a language I didn’t recognize. She held her hand toward me, showing me a shiny quarter against the palm of her black leather glove. She stared back and forth between me and the quarter, equally puzzled by both of us. Then she shamble-turned back toward the door and held the quarter by the lock, trying to see how to fit it into the keyhole. I flushed and felt my flesh retreat from her, but it was too late to flee. We stood so close, trapped together in shameful unreality, but she didn’t even know to mind. “I have a key,” I stammered, taking it out of my pocket and showing it to her. 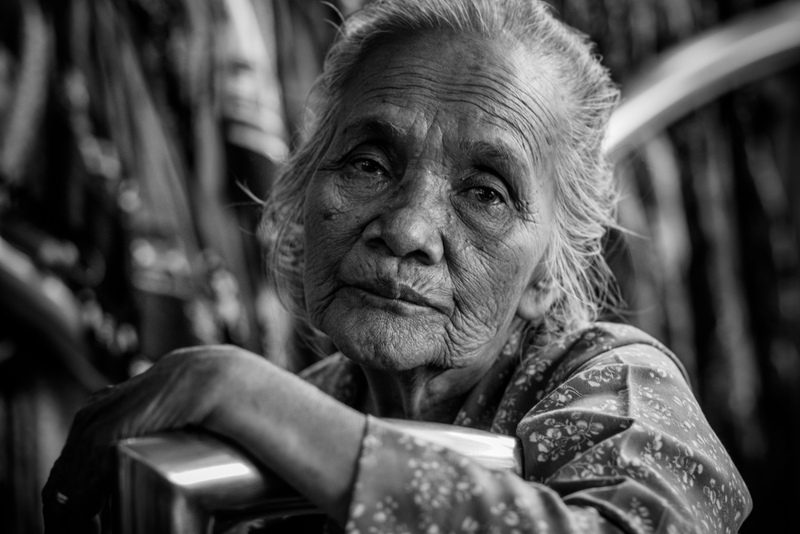 Old Lady by fariansyah (flickr.com). CC license. She displayed her coin again, demonstrated that it wouldn’t fit in the lock, and gave me an embarrassed smile. “May I try?” I asked, showing her my key again. She continued to show me her quarter. “That’s not a key,” I pleaded. Michel, our building’s Haitian doorman, came out of the service elevator in the lobby. The squared gold and blue shoulders of his uniform sagged when he saw the Hit Lady on the other side of the glass. He shook his head, stood straight again, and walked across the lobby to open the door for us. We spoke over each other. I was saying, “She’s trying to unlock the door with a quarter,” as he said in his thickly accented English, “She do this all the time.” She smiled at Michel and tottered to the elevator. I took the stairs. What could I tell my family? The old lady was not a spy, not an assassin, maybe not even Russian. She was just another aging faculty widow, an ocean away from the world of her girlhood, living out her final years on a foreign continent under the curious gaze of unacquainted neighbors and the waning forbearance of the building staff. I pictured her wandering Manhattan, lost in a false and fluid reality, shuffling the streets in a daily loop of decaying memories and blurring boundaries. Elsewhere in the city, there were, no doubt, foreign agents concealing lives of intrigue, fighting unseen battles to shape the future of civilization, but not in Morningside Heights, not at the tattering edges of the Upper West Side. B.K. Marcus is a homeschooling dad, an essayist, and a performance storyteller in Charlottesville, Virginia.